France is having second thoughts about open borders. The unfortunate thing is it took a terrorist attack to come to the proper conclusion. 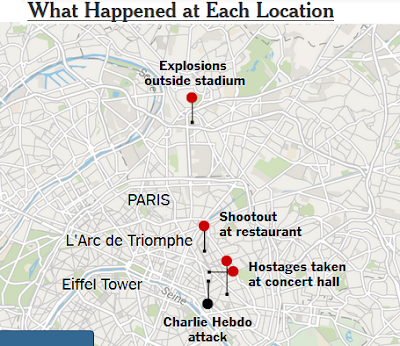 I am saddened to report Paris attacked: Dozens Dead, Hostages Taken. Paris was struck by co-ordinated attacks on Friday night, causing chaos in the French capital in one of the deadliest terrorist atrocities on a western city since September 11, 2001. President François Hollande declared that “several dozen” had died as he appeared on television to declare a state of emergency, deploying the military around Paris and closing France’s borders. At least six attacks began in busy and popular areas of the capital around 10pm local time. Special forces were sent to the 1,5000seat Bataclan concert hall on Boulevard Voltaire, where the US band Eagles Of Death Metal was due to be performing. One or several attackers were holding hostages, according a police officer with knowledge of the situation. The BBC reported that at least one man opened fire with an automatic weapon in a shootout in a central Paris restaurant shooting in the 10th arrondissement of the capital. “Given the disturbing similarities to other attacks, this clearly co-ordinated series of violent acts bears all the hallmarks of international terrorism. Many hundreds of French citizens have travelled to Syria and Iraq, and the risk from those who return is well known and severe,” he said. German’s Angela Merkel said she was “deeply shaken” by the attacks and that her thoughts were with the victims, their relatives and the people of Paris. The Paris area reeled Friday night from a shooting rampage, explosions and mass hostage-taking that President François Hollande called an unprecedented terrorist attack on France. He closed the borders and mobilized the military in a national emergency. There was no immediate claim of responsibility, but Twitter erupted with celebratory messages by members and sympathizers of the Islamic State, the extremist group based in Syria and Iraq that is under assault by major powers including the United States, France and Russia. French news media reported that Kalashnikov rifles had been involved in the shootings — a favored weapon of militants who have attacked targets in France — and that many rounds had been fired. Here's a warning headline from September 10: 'Just wait…' Islamic State reveals it has smuggled Thousands of extremists into Europe. The Syrian operative claimed more than 4,000 covert ISIS gunmen had been smuggled into western nations – hidden amongst innocent refugees. The ISIS smuggler, who is in his thirties and is described as having a trimmed jet-black beard, revealed the ongoing clandestine operation is a complete success. There are now more than 4,000 covert ISIS gunmen "ready" across the European Union, he claimed. The operative said the undercover infiltration was the beginning of a larger plot to carry out revenge attacks in the West in retaliation for the US-led coalition airstrikes. Two Turkish refugee-smugglers backed up the claims made by the ISIS Syrian operative. The revelation comes after a spokesperson for Islamic State earlier this year called on Muslims in the West to carry out terror attacks. On September 4, Nigel Farage warned Thousands of Isil fighters could use migrant crisis to 'flood' into Europe. Discussing the threat of extremists targeting the crisis, Mr Farage said: "When Isil say they will use the migrant tide to flood Europe with 500,000 of their own jihadists, I think we better listen. “Five hundred thousand may not be realistic but what if it’s 5,000, what if it’s 500? And already one of the Isil terrorist suspects who committed the first atrocity against holidaymakers in Tunisia has been seen getting off a boat onto Italian soil. Whether or not the people involved were refugees, this is precisely what many warned would happen. The risk is for more of the same, by smuggled terrorists. What a sorry, sorry way to be right. Hey chancellor Merkel, are your arms still wide open for millions more refugees? Is it too late to matter? I offer my plan once again, for the fourth time. Earlier this week Wolfgang Schäuble, Germany's finance minister called Merkel "careless". I responded Schäuble Accuses Merkel of "Careless Actions" Warns Germany Faces "Avalanche” of Refugees; Reckless not Careless. "Reckless" is clearly the word, as the whole world can now see. One cannot stop every terrorist attack of course. However, inviting terrorists with open arms is another thing indeed. And that's precisely what Merkel's absurd policy of welcoming Syrian refugees did. Peak Merkel should now be obvious to everyone.